A mysterious dig site has appeared. An obelisk was discovered. Everyone wants a piece of it, but which faction will end up with it? Factions have been created and joined, battling has begun. A victor has emerged. The question to what is in the obelisk has been solved, but a new countdown clock has appeared. What is it's meaning? After the end of the plot, a new site activity was released at the Battleground: Skirmish Battles. Read more about them at our Skirmish Battles guide. April 23rd - The Obelisk has been opened! The Sway are the victors. The prize shop is now open. There is also a new countdown clock and a note in the news, who knows what will happen next! You can view our Battling End/Rewards page for more information. March 17th - All of the Sneak Attack challengers have been defeated! March 15th - Just when you thought it was over... More challengers have appeared. This time one for each team. Look at our Sneak Attack section for more info. March 12th - The Captains of the six teams have challenged you to battle. Can you handle their might? Check out our Guide to the Final Invasion to see if you can! March 9th - Six new challengers have come to attack. Look at our Offensive Strike guide to learn about them. March 6th - The battle continues! Make way for the Raiding Party! More information about the third wave of challengers can be found at our Raiding Party Guide. March 3rd - A new wave of challengers has arrived. Head over to the Battledome to help out your faction in the Second Assault. For more information take a look at our Second Assault Guide. The team pages have also been updated with images of the new challengers. February 28th -Battling has Begun! The first charge is out. Battle members of other factions to help out your team. See our First Charge Guide for more information. Also a new NC part of the plot has been released. Luminous Casks can be found while battling, to see what items you can go to the Luminous Casks Guide. February 21st - We now have a poll! Which faction are you going to join?! February 21st - Time to pick teams. According to the timer at the Mysterious Obelisk, the war shall start in 7 days. We now have a guide about joining a faction! February 20th - The Awakened are joining the party too! At least that is how this sixth group, who's members are all undeath beings are seeing this whole affair. They want the cake that comes from the Obelisk. Or do they have other intentions as well? Our guide about the Awakened is now up. February 19th - Unlike the other teams who wish to control and use the Obelisk, the Seekers have set forth an expedition to take the Obelisk for study. They want to catalog the data, not necessarily for any benefits it may contain, weapons, gold, or otherwise. Our guide about the Seekers is now up. February 18th - Brute Squad has caught wind of the Obelisk. They claim they will be taking it by force with the strongest warriors. We now have a guide about the Brute Squad too! February 17th - A third party is interested in the Obelisk. Known as The Order of the Red Erisim, they claim to be the only ones to hold the magic to control the Obelisk. February 16th - A new mysterious group has appeared, called The Sway. They seem to be after the Obelisk as well. We have put the info we now so far together in guides about the Thieves Guild and The Sway. February 15th - It appears the Thieves Guild is going to be involved in this plot. A video has been released. 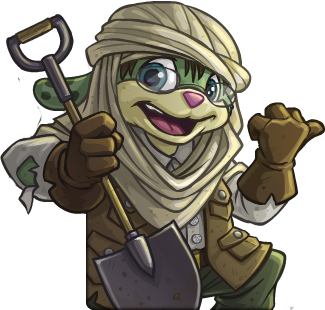 February 12th - Mysterious Dig Site has been opened. You can check out what is going on at the dig site at our Mysterious Dig Site Guide. The NC Challenge has also begun. See what items you can get with the Tyrannian Scanoscopes at our Scanning for Buried Relics Guilde. Wondering about all the plot hints TNT gave out and what might be to come? Check out our Background Information Page to get all the juicy details.